Original painting in acrylic on cotton, painting size 50x 50cm, framed with a gold mount in a hardwood frame with glass. The painting is decorated with 24ct gold. The mandala is a depiction of the heavenly abode of a deity. 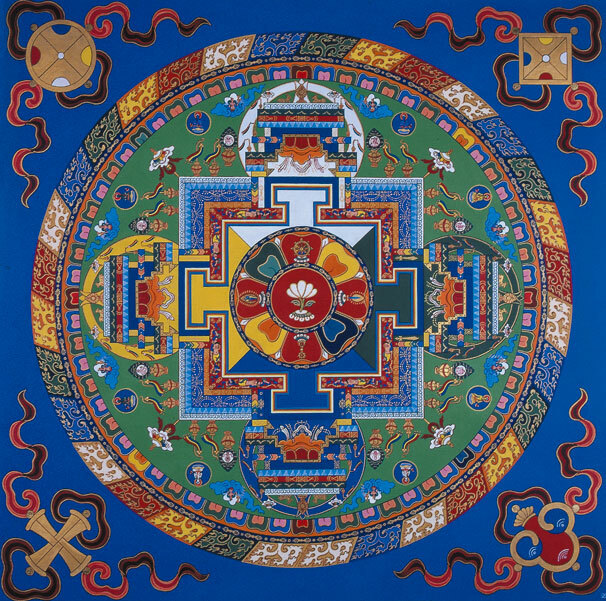 There are three outer rings of the mandala: flames (the transforming power of wisdom) vajras (unshakable commitment) and lotus flowers (purity). At the centre is the temple, beautifully adorned, with four directional gates, which open to reveal symbols of the qualities of the buddha of compassion, who appears here in the form of a single white flower.